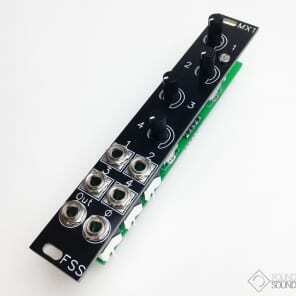 The MX1 mixer module from FSS is designed to present a compact, affordable mixing solution for Eurorack users. The MX1 gives four audio inputs in as many HP, with both normal and phase-inverted outputs available. The level controls of the MX1 are logarithmic, but the channels are DC coupled, so CVs can be summed together using the MX1 if necessary. The MX1 provides unity gain of each channel when the level control is fully clockwise, meaning that there is no loss of signal when mixing. This also allows for the MX1 to be overdriven, especially if the same source is multipled to the four inputs. A set of expansion headers also allow for the FSS P.O.C.A. VAC1 and Whitehall SW1 modules to be used alongside the MX1 without any patching required. -Expander board and cable allow for normalling from FSS VAC1 and SW1 modules. Module depth: 39mm behind 2mm front panel with expander attached.